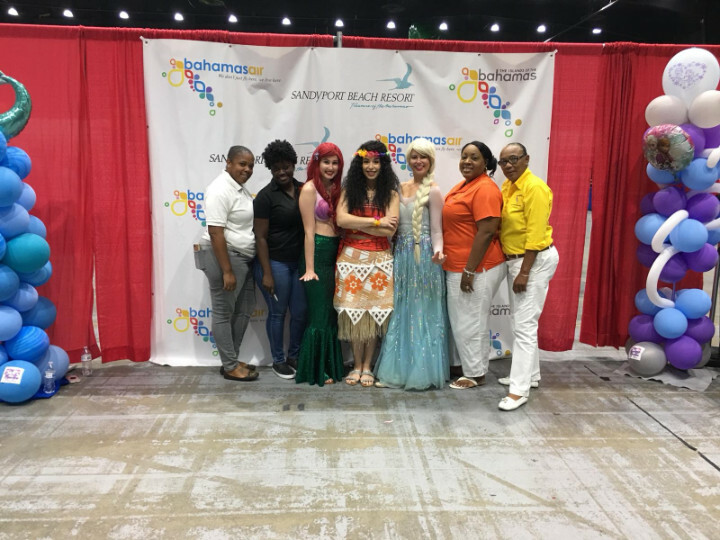 Pictured from left to right are: Cheralda Arnett, Assistant General Manager, Sandyport Beach Resort; Shonique Farquharson, Sandyport Beach Resort; Disney’s characters, Princess Ariel, Moana and Elsa; Jennifer Gardiner-Bannister, Area Manager, BMOTA-Plantation and Donna Mackey, Sr. Sales Manager, BMOTA-Plantation. WEST PALM BEACH, Florida – Children of all ages along with their parents and families came from near and far to participate in the 16th Annual Our Kids World Family Fun Fest held April 28 and 29, at the South Florida Fairgrounds in West Palm Beach, Florida. The Islands Of The Bahamas, including Bahamasair and Sandyport Beach Resort, were prominently featured at the two-day show, which attracted more than 20,000 families. The premier South Florida event, which is held twice per year, in April and August, was organized by Alpha Media Network, the Bahamas Ministry of Tourism and Aviation’s (BMOTA) newest partner and featured some of the popular characters from Disney Films including Moana, Princess Ariel, Elsa and Jack Sparrow of Pirates of The Caribbean – Dead Man’s Chest, the latter of which was filmed in The Bahama Islands: Sandy Cay, Exuma and Gold Rock Creek, Grand Bahama. Scores of children and their parents lined the booth to meet, greet, photograph and interact with Disney’s famous characters and register to win a Bahamas vacation, including round trip airline tickets for two on Bahamasair from Florida to Nassau and a four days, three nights stay at Sandyport Beach Resort. 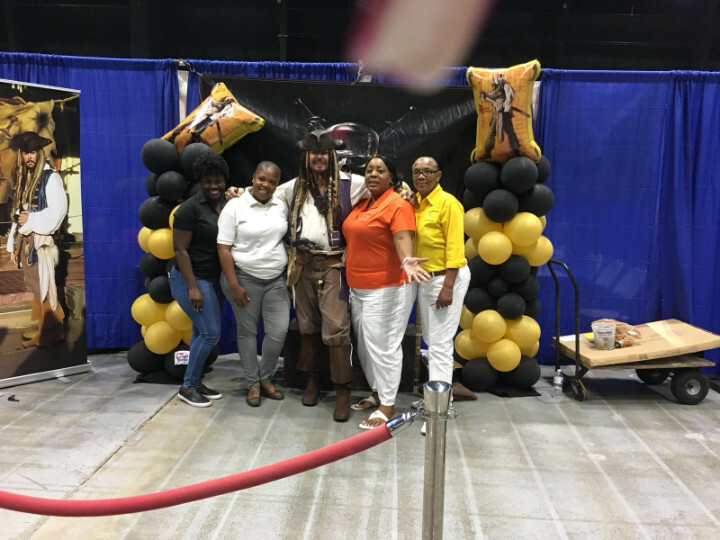 Pictured from from left to right: Shonique Farquharson, Sandyport Beach Resort; Cheralda Arnett, Assistant General Manager, Sandyport Beach Resort; Jack Sparrow, Pirates of the Caribbean; Jennifer Gardiner-Bannister, Area Manager, BMOTA-Plantation and Donna Mackey, Sr. Sales Manager, BMOTA-Plantation. "Participating in Our Kids World Family Fun Fest was a natural fit for us at Sandyport Beach Resort. The characters were a hit with all the children. Jack Sparrow from the Pirates of the Caribbean and the mermaid Ariel really set the island tone for us. With sugar-soft sand perfect for sandcastle making, 300 days of sunshine, and beautiful crystal-clear waters that simply take your breath away, The Bahamas is the perfect destination for families,” said Cheralda Arnett, Assistant General Manager, Sandyport Beach Resort. “Our resort is perfect for families and provides everything, from three bedroom suites and full kitchen facilities, ideal for catering to kids to our zero-entry sand edge swimming pool and water slides. Our friendly and professional staff are readily available to organize authentic experiences ranging from swimming with the pigs, pirates themed parties, kissing dolphins, marching with flamingoes, chocolate making as well as providing pampered care for our tiny guests, while their parents enjoy private time together,” she said. The Islands Of The Bahamas have a place in the sun for everyone, from Nassau and Paradise Island to Grand Bahama to The Abaco Islands, The Exuma Islands, Harbour Island, Long Island and others. Each island has its own personality and attractions for a variety of vacation styles with some of the world’s best golf, scuba diving, fishing, sailing, boating, as well as shopping and dining. The destination offers an easily accessible tropical getaway and the Bahamian dollar is on par with the U.S. dollar. Do everything or do nothing, just remember It’s Better in The Bahamas. For more information on travel packages, activities and accommodations, call 1-800-Bahamas or visit www.Bahamas.com. Look for The Bahamas on the web on Facebook, Twitter and YouTube.